Yosakoi - disco style festival dance. Too bad they don't let people participate. In Britain singing is a sacred act - that people do in church for instance - that people do not readily take part in unless they have practised or they are doing it with many other people in a very similar way as they do in a choir or UK-style Karaoke. 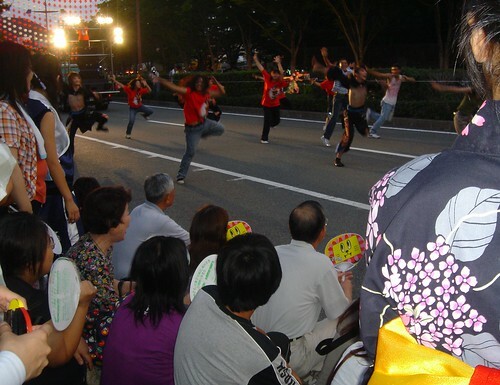 In Japan dancing is a sacred act - that the Japanese do at shrines and temples - that Japanese people do not participate in unless they have practised and are doing it with other people in a very similar way. Lacan (2007) argued that humans need to have visual and verbal representations of self, and that the self exists as a result of the presumed intersection of these self representations. Lacan also argued that humans move from having a predominantly visual self(Lacan, 2002), to having a predominantly verbal, or narrative self(McAdams, 2006). The visual self is therefore for Westerners the inferior of the two representing the external aspect of self, whereas language is thought to be the private self itself. This is of course very strange. Vision is no more private than language, a most public, learnt, and communicative of media. To most Westerners vision is inextricably linked with 'mere appearance', surface, and "wrapping," (Hendry, 1995) whereas language is linked with mind. I argue that Japan is permanently "in the mirror stage" or "Nacalian," in that these Lacanian hierarchies are reversed. In Japan, vision is closely associated with, and thought (see next post) to be mind (Nishida, 1988; Heisig, 2010). Language, even the language of science with the ephemeral world of hypothesis (Takeuchi, 2006), and language in general with public communication(Nakashima, 1999,1997). Heisig, J. W. (2010). Nishida’s Deodorized Basho and the Scent of Zeami’s Flower. Frontiers of Japanese Philosophy 7: Classical Japanese Philosophy (p. 247–73). Nagoya: Nanzan Institute for Religion and Culture. Retrieved from http://nirc.nanzan-u.ac.jp/staff/jheisig/pdf/Nishida%20and%20Zeami.pdf Hendry, J. (1995). Wrapping Culture: Politeness, Presentation, and Power in Japan and Other Societies. Oxford University Press, USA. Lacan, J. (2002). The mirror stage as formative of the function of the I as revealed in psychoanalytic experience. In B. Fink (Trans. ), Ecrits (pp. 75–81). WW Norton & Company. Takeuchi, K. 竹内薫. (2006). 99・9%は仮説 思いこみで判断しないための考え方. 光文社. McAdams, D. P. (2006). The role of narrative in personality psychology today. Narrative Inquiry, 16(1), 11–18. Nishida, K. 西田幾多郎. (1988). 西田幾多郎哲学論集〈2〉論理と生命 他4篇. 岩波書店. I love your blog! I have a friend who went to Japan and ended up marrying a girl there and has lots of little kids now over there. Always wanted to visit there. My grandparents were there twice. Love the photos and the witty comments. Yours is a window on the world for this IT Director from the States.